Dog Portraits from Photographs with No-Risk Guarantee! "Own a unique, exclusive oil painting of your Dog, created by a specialised artist from your own favourite photograph..."
One of our team of specialised artists will create the finest quality, exclusive, hand-painted oil painting from your own favourite dog photograph, on fine quality European linen canvas. A beautiful gift for any dog-lover, whether it's for you or a friend or loved one! Your favourite dog photograph can be recreated in vibrant oils in a wide range of sizes to suit your individual requirements and budget. With prices starting at less than £100/US$150 (click here to see our 'Price Guide'), it is no surprise that creating beautiful hand-painted dog portraits from photographs is one of our most popular services. You could easily pay between five and ten times the amount for an oil painting of this quality if you ordered from a Gallery (that's if you can find one that operates a 'Paintings from Photographs' specialised service). As our business is now solely on the internet and from recommendations, we don't have the high costs of a Gallery or a High Street shop to support, so you benefit directly from our very low overheads. If you'd like to discover some more facts about our works of art, click here. 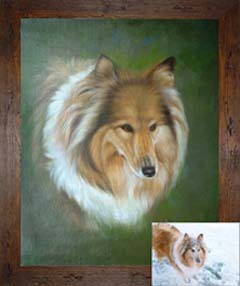 An oil painting makes a very special, unique gift and imagine the joy of receiving a fine oil painting of a favourite dog portrait. Why not transform your favourite dog photograph into your very own work of art? A priceless gift to cherish forever! You can buy them a Filman Fine Art Gift Voucher here and let them choose for themselves! This makes a perfect gift for any occasion.